Jim the best way to deal with this is to alter the rib bay along side of the fuse. Do whatever you need to do in order to get a tank into the wing. Here's a pic of my all time favorite 1/2A which is the Baby Tomahawk by Dumas. 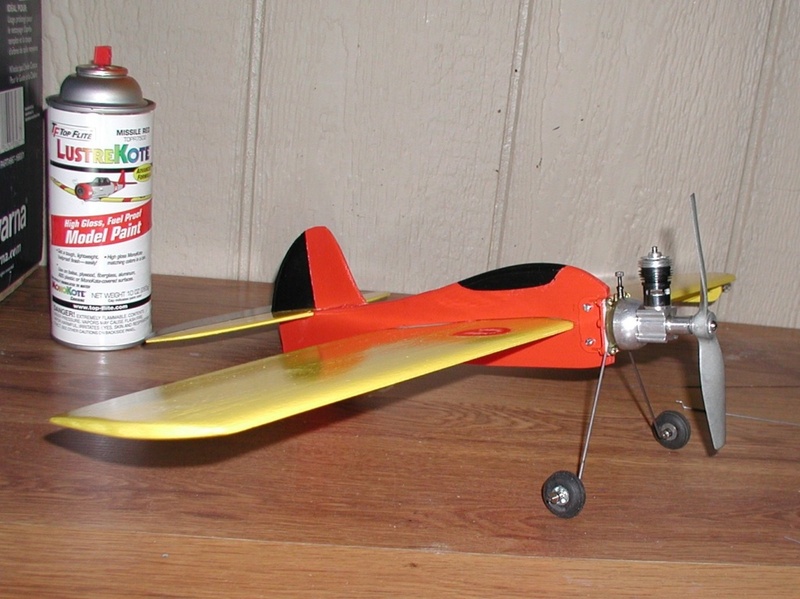 I built this plane 36 years ago and even though I have obliterated it a dozen times, it was what taught me how to build tanks and what was needed to do in order to make them work. While I learned many lessons, I kept smashing the plane until I finally got it correct. While I knew better back then not to drill through the leading edge, I did it anyhow but I do have a piece of ply epoxied onto the back of it prior to drilling out the hole for the pickup. Today, I would replumb the tank as I always do and the fuel pickup would be on the bottom. Here's a pic, I used silicone to hold the tank in, the tank bay was fully sealed prior to tank installation. Now if I was to redo this plane today, not only would I reconfigure the tank differently, you can see the piece of brass tubing on the wing. The tubing I have laying on there represents where the fuel pickup should be. In other words, the tank currently while it does work, theoretically it should be considerably inboard more. This is why TD also don't draw fuel correctly on profiles, the pickup due to tank design is too far outboard causing a automatic lean condition. I'm using engine offset to kick the venturi further outboard to assist in getting it inline with the pickup. It's better for any profile to utilize a longer narrower tank vs one that's short and wide as this places the pickup too far outboard compromising fuel draw. I like integrated fuel tanks Ken, got one on my home built what-ever pictured here a few times. 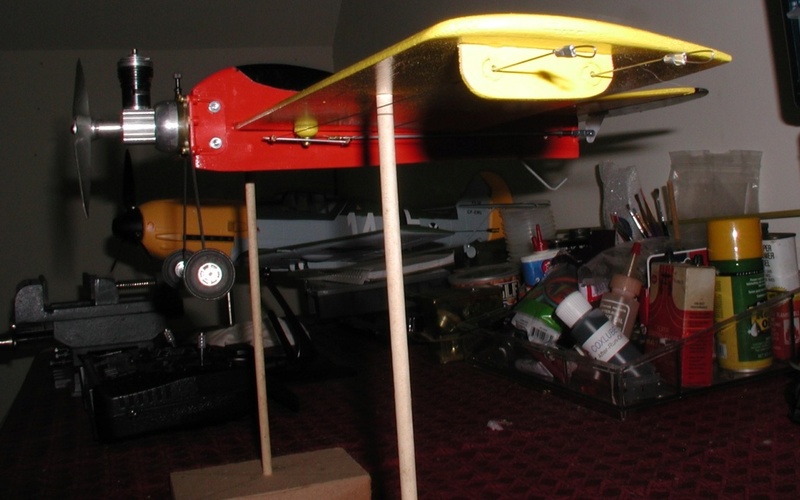 But I put it in a profile fuselage. Except for the tail skid the new Baby Ringmaster is done. 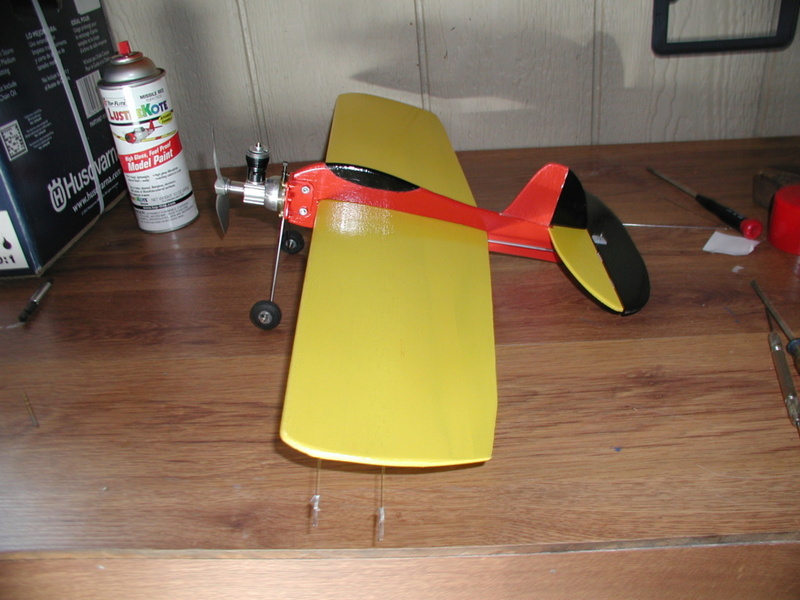 Fastest I have ever built a model plane. Bench tested a Baby Bee. 45 degrees in the garage, pop but no fire. Got out the heat gun, started first flip and runs great. Stuck it on the Baby Ring thrust line even with the wing. Not sure about the vertical thrust line, left the front of the fuselage just like Chancy's tracing and the Goldberg mount sets it. I used R/C control rod for the elevator, thick and heavy but less flex than my usual. I never get the z bend and length quite right so I used adjustables. Bob, if I may. I was in the same boat as you regarding making a 'Z' bend in the correct place. To resolve this, I firstly made a pair of 'Z' bend pliers from an old regular set of pliers using a Dremel cutoff wheel. This first enabled me to make neat 'Z' bends. Secondly, to aleviate the problem of mounting. I would just set my bellcrank into place where I wanted it. Make the first 'Z' bend for the elevator control horn and install. Then mark teh control rod where I wanted the next bend and make it. I then install it on the loose bellcrank and mount it where it needs to be. I do this by clamping the tail together with two larger sticks held together by rubber bands on the ends to keep it neutral. 99% of the time, I am withing 1/16" of where I want to be. Not saying you have to do it, but rather just throwing out another option if you decide to try it. I generally get it right after two or three tries with fine wire. 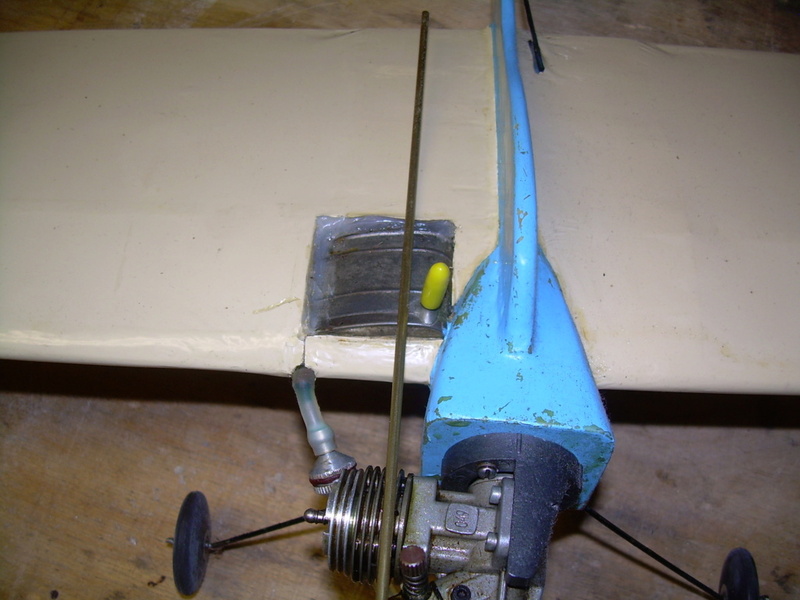 But I couldn't find any mid fuselage guides to prevent bending so I went with the thicker gauge. Might regret it though as it adds weight in the wrong place. It's balancing about an 1 1/8" back from the leading edge. I could have moved the tail up about a quarter inch, but thought the tail moment extremely short as is. 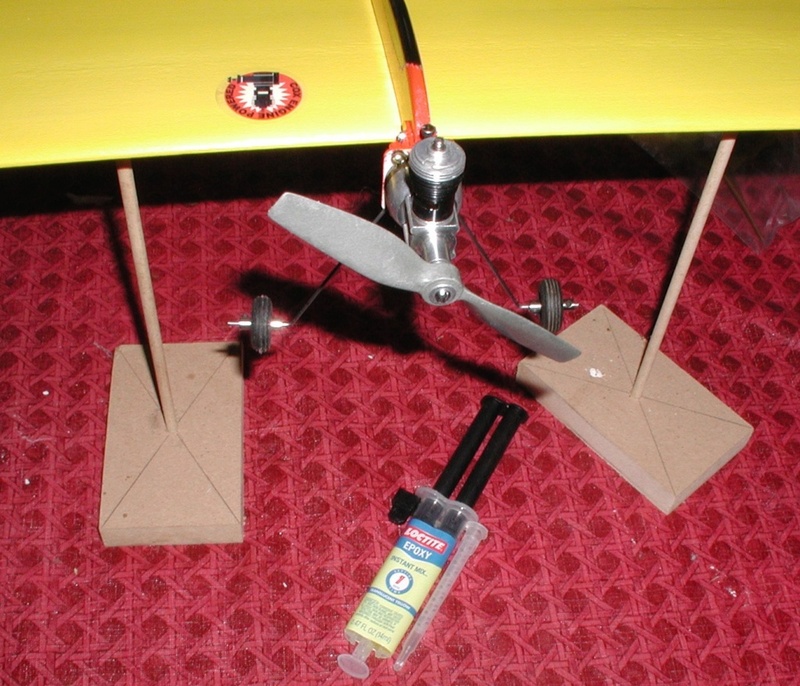 I could add a spinner on the Cox, bend the landing gear forward a bit and substitute balsa for the tail skid. I still have to epoxy the wing. I have this self mix stuff that has a bead applicator. Never used it before but thought I would give it a try. I bought what was supposed to be Z bend pliers, but I could never get them to work correctly. 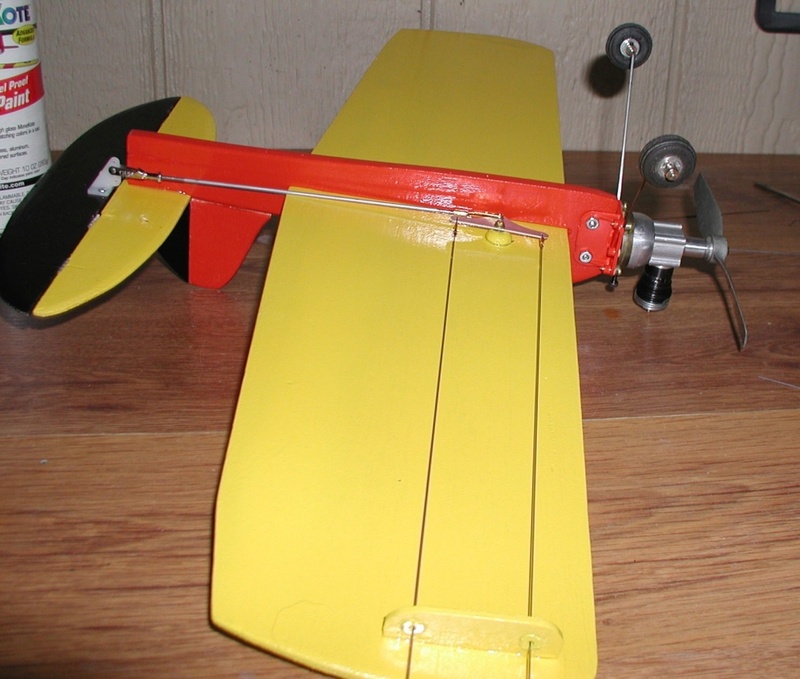 Anyone fly one of these this weekend? I may be able to fly tomorrow. Windy today, and with Mark over I would have given it a try. One thing for sure it's a lot lighter than my built up original. I have used a bunch of those applicators at work. Just to be safe, we push out a good inch or two before using on the final product just to ensure that what is coming out is thoroughly mixed before using. They are good though. When finished just leave the tip on as a cover. When you need it next, replace it or just use as regular. Based on Bob's CG, I need to trim quite a bit off the front of mine.